It has been too hot this summer to consider cold-weather sewing, but fall is on the way! And that means that our new Lisette for Fall-Winter 2016 patterns are now available. This is the first of our two new releases this season. It’s a pattern I’ve been wanting to develop for a while, and who better to do it with than Butterick? This style, Lisette for Butterick B6385, is a classic, fitted, fully-lined coat. This is the coat you’ll turn to again and again for almost any event or purpose. It’s a feminine, elegant style that can obviously be worn for dressy occasions but can also be worn more casually with jeans and sneakers if you’re relaxing for the day. Here’s what I love about it: princess seams. You know what this means, right? It’s so easy to fit your own body when you have princess seams. And to make it even easier, we’ve already included piece for various cup sizes, so a lot of the fitting work has already been done. I included a Dior dart in this design, just for the fun of it. A Dior dart is a short dart that allows the princess seams to be shifted toward the side seams a bit. I think it’s a nice little detail, and it’s easy to sew. And here’s another thing I love about this pattern: we included three different collar options and two different pocket choices, so you can customize the coat to your preferences. 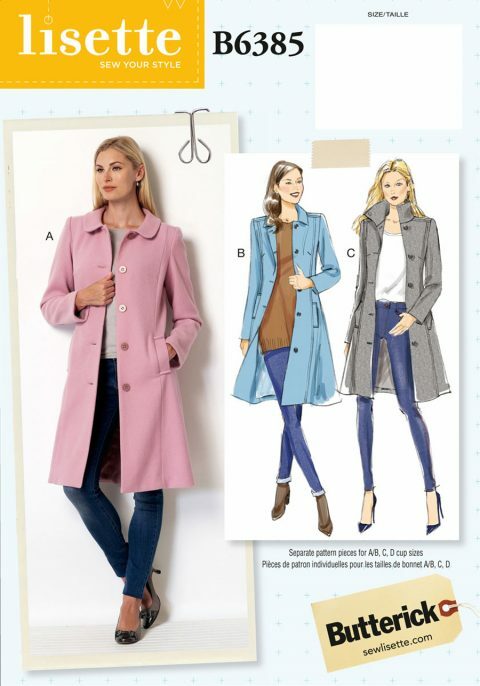 The pink coat on the envelope cover features the rounded collar, but you can also choose from a pointed collar and a tall funnel-neck-y collar. I’m considering playing with the funnel collar and making it even taller so it’s really dramatic when the collar is worn open. I’ll let you know how it goes when I sew it. This is a really classic style, so feel free to have fun with your fabric and lining choices when you sew it. 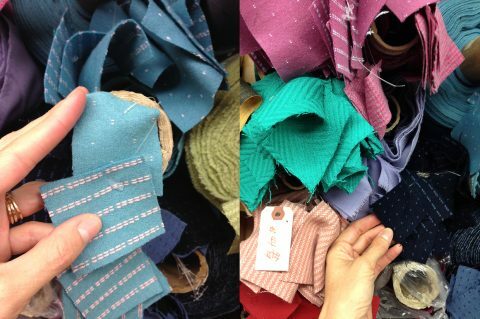 I found some beautiful wool coating fabrics when I was shopping in New York last month. Isn’t that pink herringbone in the photo below stunning? And I like the wrong side of the dobby dots as much as the right side. They look like a series of running stitches (which is basically what they are). I think any of these fabrics be fun for the coat. As always, I’ve assembled fabric and styling ideas for this pattern for you. 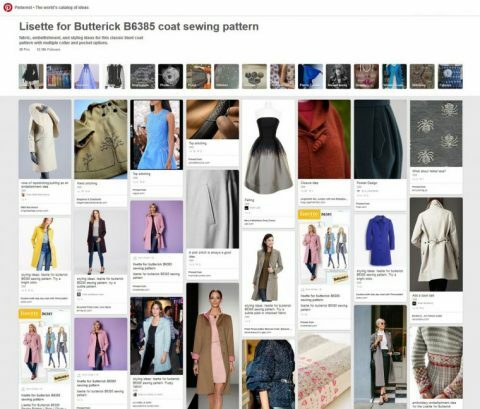 Take a look at my Lisette for Butterick B6385 coat sewing pattern Pinterest folder for lots of ideas, including some embellishment ideas if you’re so inclined. I hope you’ll have fun sewing and wearing this style! There may be a sew-along somewhere in the future, too. I’ll let you know. For now, though, you can order the pattern right now from the Oliver + S shop or get it wherever Butterick patterns are sold. This coat is stunning. I will be heading out tomorrow to track down the pattern! What are the two pocket choices, Liesl? I’d guess the pink coat shows in-seam welt pockets – but I’m not great on pocket terminology! I love the idea of the cup sizes being included. This is going to be my coat for this winter! I bought the pattern, the cup sizes was a big plus for me and I will make the funnel neck version. I have just started to make up the B6385 Coat, got as far st installing the pockets, went look at the next page of instructions and there isn’t any, the other sheet I have goes straight to the lining, can you help please.